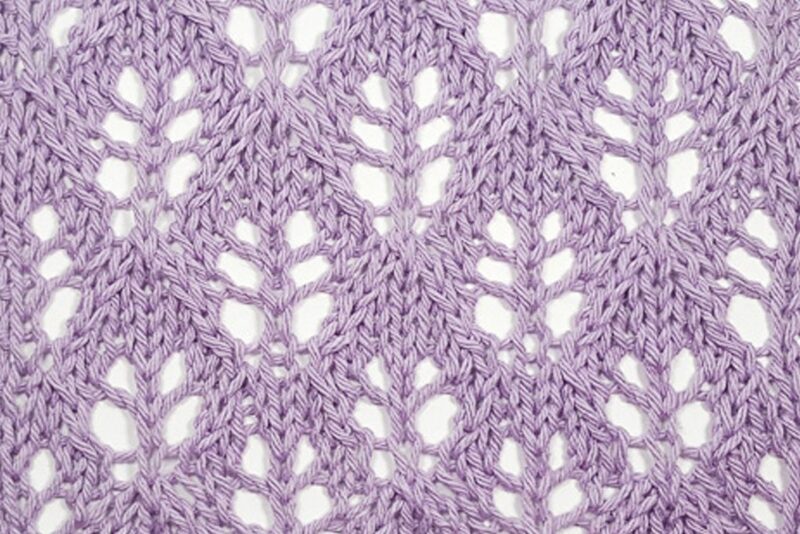 Learn all the skills you need to FINALLY conquer your lace knitting fears. You have always admired knitted lace, but have been too afraid to try it. It looks SO complicated and feels WAY beyond your skill level. You have dipped your toe in and tried knitted lace, but immediately felt overwhelmed. The pattern contained very little “pattern” and mostly consisted of a chart that made no sense. You thought you were rocking and rolling on this lace knitting thing until you dropped a stitch, or forgot a yarn over, and almost cried when you realized that you didn’t know how to fix it without ripping everything out! 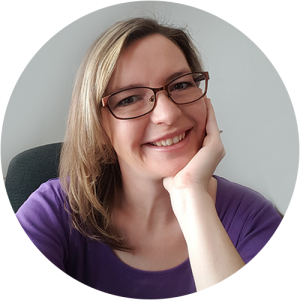 I’m Dawn, and I’m your lace knitting secret weapon. I’ve totally been where you are now. Over the course of my 20 year knitting career, I’m pretty sure that I have made every mistake there is to make. Through trial and error (and let’s admit, lots of frogging) I learned how to fix them and how to avoid making them in the first place. Oh, dear knitter, yes you can! Believe me, if I can do this, you can too! You just need a friend in your corner to help you along the way. 7 modules so packed with juicy information that it’s like getting 4 courses for the price of 1! 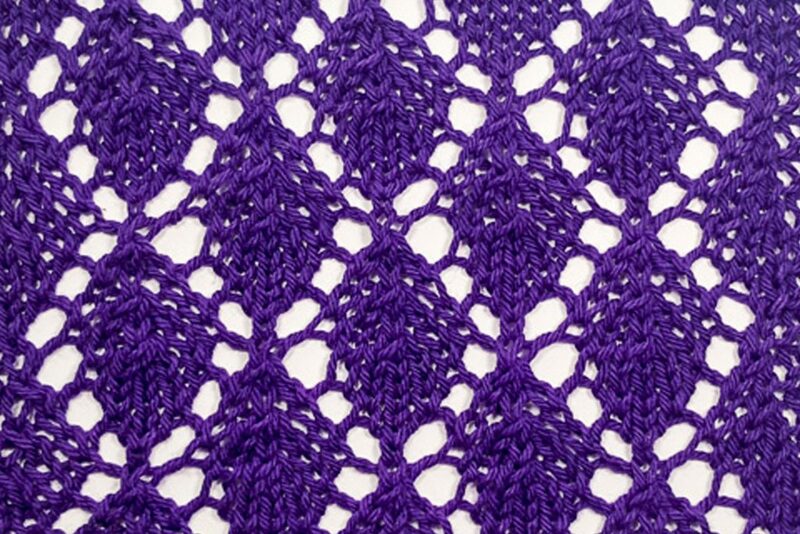 Module 1 is a tasty overview of lace knitting as a whole. We’ll dispel some knitting myths, learn how lace fabric is formed, get all of Dawn’s best tips on choosing the best yarns and tools for the job, and gather all of our supplies for our adventure. Module 2 is all about stitches! 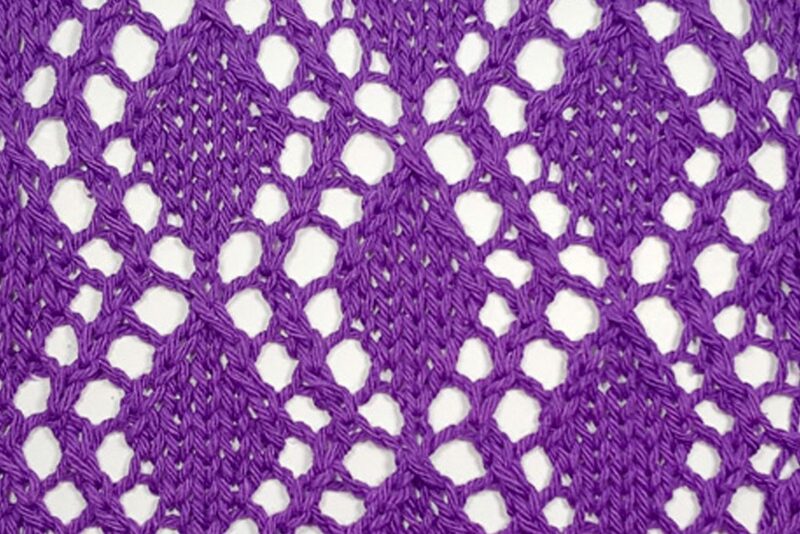 Learn the 5 stitch types used in lace knitting, how to combine them together to form amazing lace, and how to make substitutions to fit your own personal knitting style. 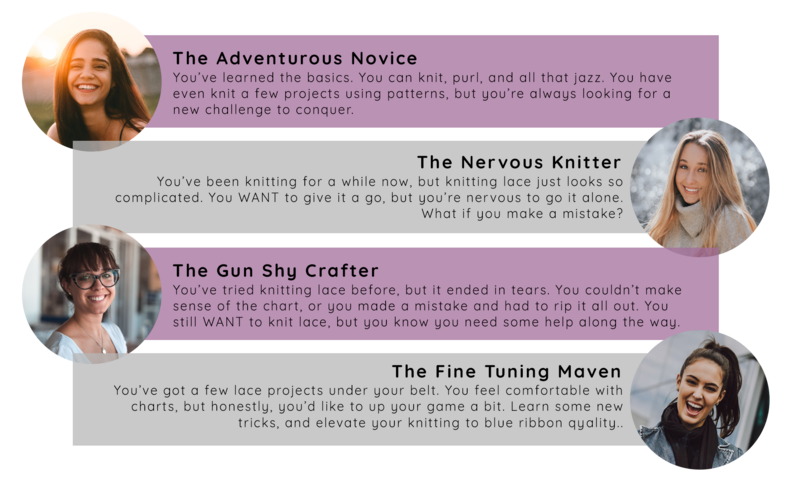 Module 3 is all about “Secret Code” language of knitters all over the world – CHARTS! In this module we dive so much deeper than any blog post you’ve ever read on charts. We talk about how charts relate to your knitting, why designers use them, how to decipher the symbols (even without a key), and even introduce you to the BRAND new form of chart design that is taking the internet by storm. Module 4 is all about preventing mistakes. The best offense is a good defense after all. Learn all of Dawn’s secret tips and tricks to prevent 90% of mistakes from ever happening, including the absolutely ESSENTIAL tools every lace knitter needs in their knitting bag. The one module that knitters tell us absolutely BLOWS their mind. Module 5 is all about fixing mistakes. They happen to everyone. What separates the truly amazing knitters from the crowd is their ability to fix them. 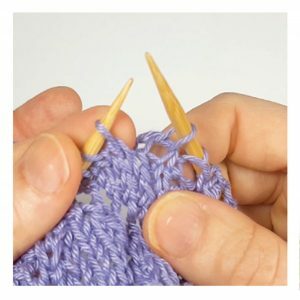 Learn Dawn’s secret sauce technique to fix ANY knitting mistake without memorizing a dozen techniques or having a masters degree in knitting. Module 6 - Show Me The Magic! 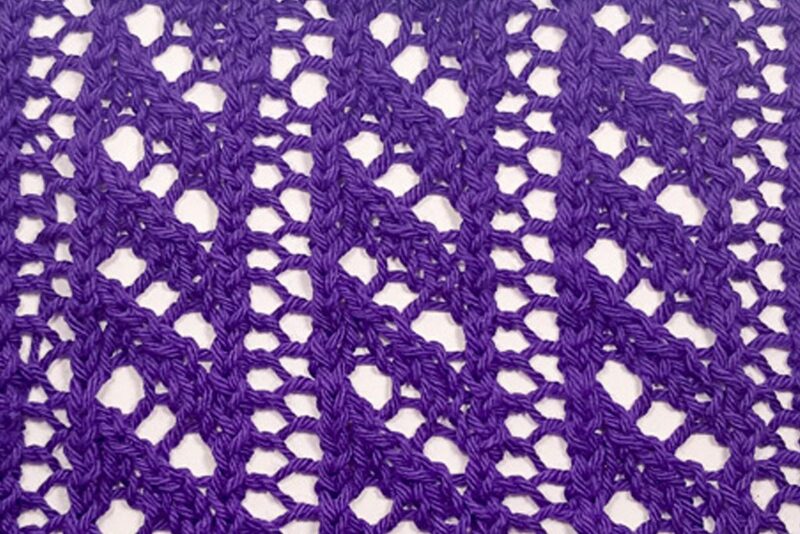 Module 6 is all about blocking. Learn the secret that will take your finished lace from so-so to stunning in the blink of an eye. You’ve learned the theory, now it’s time to put it into action! 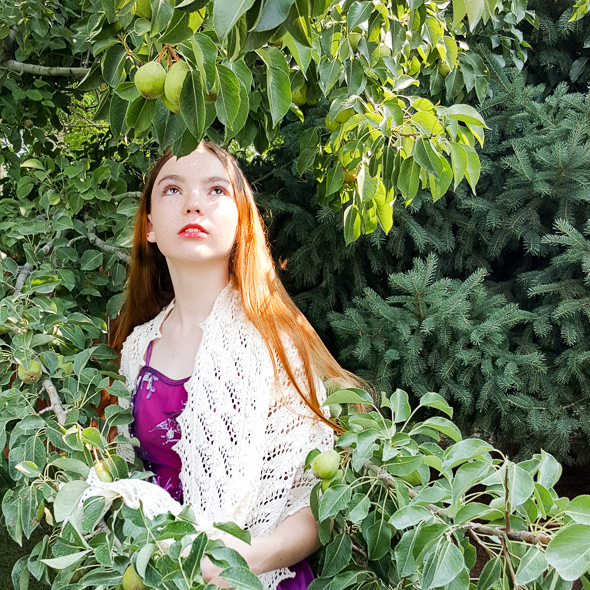 Knit yourself a stunning Dew Drop shawl designed EXCLUSIVELY for the Conquering Lace course and available only to CL students. 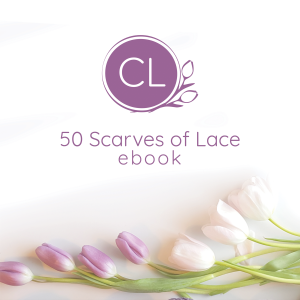 Become your own lace designer! You’ve got everything you need at your fingertips to easily mix and match stitch patterns and edgings to create over 50 stunning scarves in any weight your heart desires! 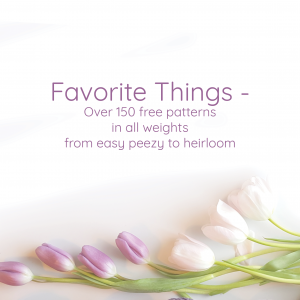 Over 150 of Dawn’s all time FAVORITE free patterns on the internet all in one place! From hats to scarves, and shawls to blankets, you’re sure to find exactly what you’re looking for. Cataloged and indexed, guide includes pattern type, yarn weight, and difficulty level, so that you are just a mouse click away from your next great knit! 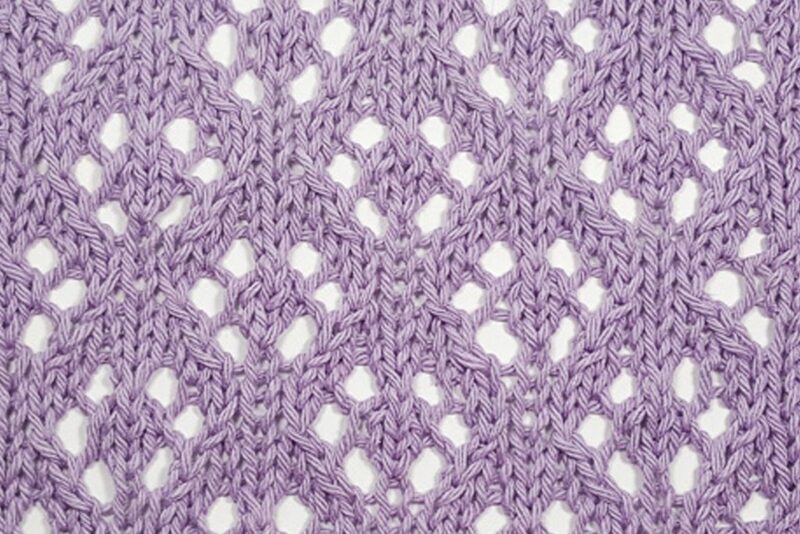 Find everything but the kitchen sink in this comprehensive lace knitting stitch library. 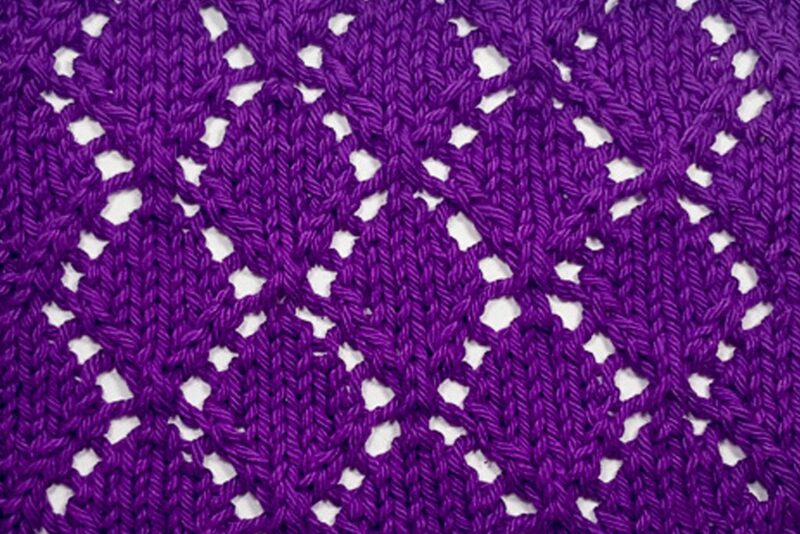 Find cast-ons, bind-offs, increases, decreases, and special pattern stitches clearly demonstrated in both the English and Continental methods. You get all the instruction of a 4 day knitting retreat with the peace of mind of having a knitting instructor just for you right in your living room! Videos, downloads, cheat sheets and patterns that you can watch over and over, download at any time, and have access to FOREVER. Your own personal knitting teacher (hi, that’s me!) in your living room so you can ask questions, pick her brain, and share your progress even MONTHS down the road. A whole community of awesome classmates to help and cheer you on. I'm a busy person, what kind of time commitment are we talking here? While you will get all of the information of a 4 day knitting retreat, each module will only take you about 30 minutes to complete. That gives you more time to knit and practice your skills! Since this is a work at your own pace course, you can break up that time however you want. Cram the videos all into one day, or space them out to fit your schedule. And of course watch as many times as you need. As a member, you have lifetime access to the course plus any additional updates or bonuses that we may add in the future! What is this 30 Guarantee? If the Conquering Lace course doesn’t end up being what you were expecting, don’t fret. We have a 30 day money back guarantee, no questions asked. Do I get access to everything all at once? Yes! There is no dripping of content here. You get access to EVERYTHING right from day one so you can go at your own pace. I'm a new knitter, is this course for me? 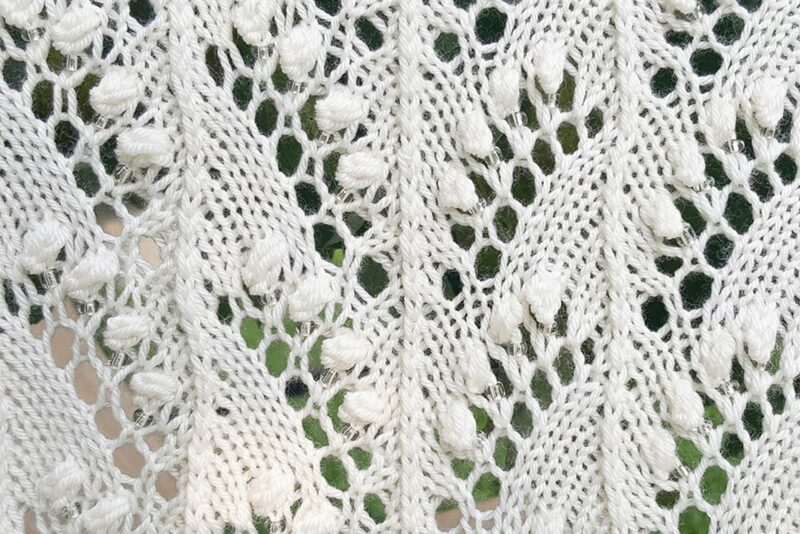 Conquering lace is an intermediate to advanced knitting course. If you can do all of the following knitting skills, then yes! This course is for you. If not, you probably want to wait just a bit until you have mastered these skills. Read and understand basic knitting patterns. I have A LOT of lace knitting experience, is this course for me? While we love to teach knitters of ALL experience levels, if you have a lot of lace knitting experience, this course may feel a bit redundant for you. We do include some proprietary information unique to Dawn as an instructor, and some tips and tricks you may not be familiar with, but overall, the course is designed for knitters who are new, or have very little lace knitting experience. I'm an English knitter will this work for me? Yes! Demonstration videos include both English and Continental methods so everyone can follow along. I'm a Continental knitter, will this work for me? I knit using an unusual method will this work for me? We understand that there are MANY different ways to knit (Dawn herself prefers the Combined style), but the demonstration videos only show the 2 most common styles. If you knit in a way OTHER than Continental or English styles (such as left handed backwards), you are probably quite adept at this point at adjusting patterns to meet your needs. The course includes full color photographs of what each stitch should look like. If you would like to take Conquering Lace, you will need to figure out on your own how to form those stitches in your preferred style. What is this 30 day money back guarantee? We are so confident that you are going to LOVE your knitting course that we offer a 30 day test drive. If you don’t love you course (although we know you will), just shoot us an email within 30 days of purchase and we’ll refund your money. No questions asked.